While my June Quick Lit was shorter than normal, today's is longer! I read 17 books in July, and I'm excited to share what I thought about most of them today. 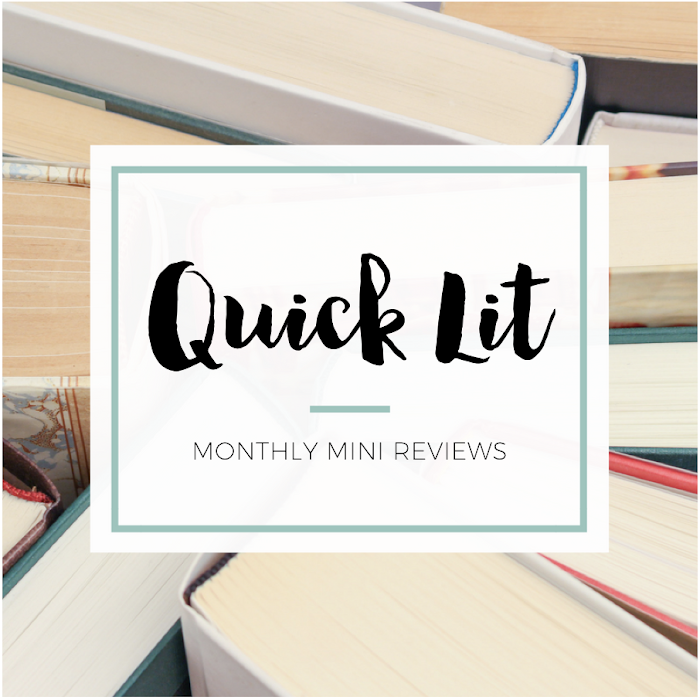 If you're looking for more book recommendations, check out the Quick Lit linkup at Modern Mrs. Darcy to see what other bloggers have been reading lately. In case you missed it, I co-hosted the Bestie Beatriz Binge in July - an event with Kelly from Belle of the Literati to celebrate our shared love of Beatriz Williams. One of the posts featured mini reviews of all nine of Wiliams' novels: Overseas, A Hundred Summers, The Secret Life of Violet Grant, Tiny Little Thing, Along the Infinite Sea, A Certain Age, The Wicked City, Cocoa Beach and The Forgotten Room. It was so fun to talk about my love for this author. And although it was posted on the first day of August, I should also mention my reviews for Catch of the Day, The Next Best Thing and Somebody to Love by Kristan Higgins. I loved bingeing this series in July! And I'll share my review soon for my July favorite (and a Best of 2017) - The Almost Sisters by Joshilyn Jackson. UNEQUAL AFFECTIONS BY LARA S. ORMISTON | This was an audio re-read for me, and I was curious to see if I'd love it just as much a second time. This Pride and Prejudice retelling asks the question, What if Elizabeth Bennet had said yes to Mr. Darcy's first proposal? I said before that it was my favorite retelling, and I stand by that statement. It's not perfect, but it retains the spirit of the original while still bringing something new to the story. The audio was a great experience, too, because I really enjoyed the narrator! I'm So Obsessed With It. MYSTIC SUMMER BY HANNAH MCKINNON | I liked my first McKinnon book, The Lake Season, but didn't love it. Thankfully, I tried again with this book, which was a gift from Cassie. Once again, I loved the setting of seaside Connecticut. McKinnon made me want to visit! The characters were great, and I was immediately hooked on the story. It was a light, quick read that was perfect for an afternoon by the pool. I can't put my finger on what it was missing that would have made it a favorite, but I'm happy to say I So Enjoyed It. CHASING SLOW BY ERIN LOECHNER | I don't read Loechner's blog, but I saw this book in a store while browsing one day and was intrigued. It's so beautifully designed - inside and out - and I liked the idea of a book about choosing simplicity in your daily life. But man, it did not live up to that premise. The writing was sometimes nice but often meandering, packed with dumb metaphors and very repetitive. It read like a series of blog posts that lacked direction or depth. I'm So Over It and walked away wondering why I even bothered to finish it. 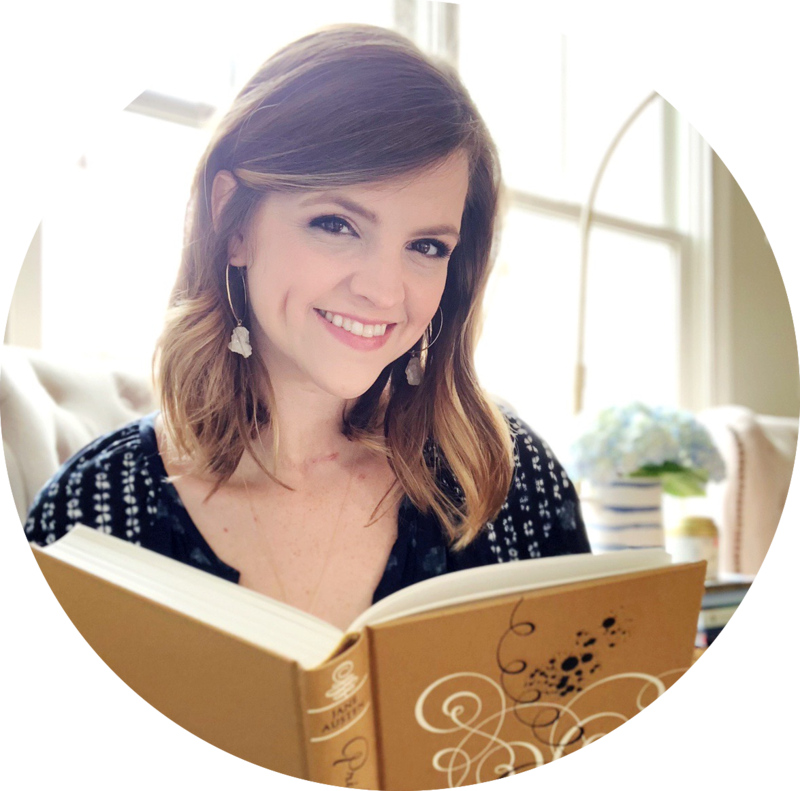 WHAT TO SAY NEXT BY JULIE BUXBAUM | Buxbaum is an all-time favorite author for me, so I had high expectations for this release. Thankfully, it completely delivered! I loved the two main characters - Kit and David - and enjoyed reading from both of their perspectives (particularly the thoughtful representation of someone on the autism spectrum). I adored their blossoming friendship and felt so emotionally invested in everything that was happening. This is a short book, but it packs a punch. I So Loved It, in case you can't tell. THE KNOCKOFF BY JO PIAZZA AND LUCY SYKES | I found this book at Goodwill one day and bought it on a whim. I loved the idea of a modern retelling of the movie All About Eve set in the fashion journalism industry. I ended up listening to the audio because I love narrator Katherine Kellgren, and I couldn't turn it off! It was such a clever take on tech, fashion, journalism and aging in the workplace. I felt like many of the situations and characters were exaggerated for comedic effect, but I still So Enjoyed It. It was mostly fluff - but fun! WHEN DIMPLE MET RISHI BY SANDHYA MENON | I'd been anxiously awaiting this release ever since the cover was released, and the hype in the blogging world just added to my interest. I'm happy to say that the book was just as cute as I'd hoped it would be! I loved the diversity in this story, and it was great to learn more about Dimple and Rishi's culture. The romantic comedy elements were adorable, even if they were somewhat predictable. I wanted more from the summer camp and coding project, but I So Enjoyed It overall. GODS IN ALABAMA BY JOSHILYN JACKSON | The first time I picked up this book, I read 60 pages before returning it to the library. I didn't run out of time; I decided not to finish it. The writing voice was fantastic, but the story felt so bleak. After falling in love with The Almost Sisters, I decided to give this one another shot. And I'm glad I did. I love Jackson's characterization, dialogue and intriguing story. I've debated the rating a bit because the heavy subject matter makes it hard for me to broadly recommend it, so I'll say I So Liked It. 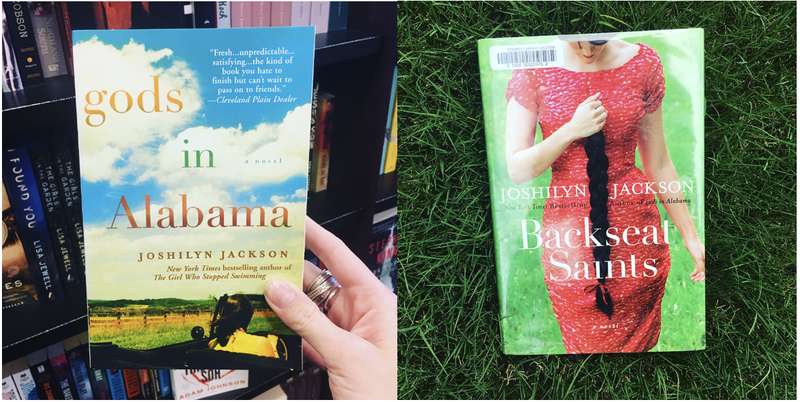 BACKSEAT SAINTS BY JOSHILYN JACKSON | When I found out this book was a companion to gods in Alabama, I knew I had to read it next. I loved that Jackson took a minor character from Arlene's story and made her the heroine in this one. While you don't have to read them in order, I'm glad that I did. Once again, Jackson tackles very serious topics with honesty and sensitivity. I couldn't stop thinking about this story and character after I was done. I So Enjoyed It (and would recommend it on audio, too, which was the format I read). I'm so glad to hear that Julie Buxbaum's next book is a hit. I really enjoyed her last one so it's good to hear this was another winner! Ah I'm so glad you loved WHAT TO SAY NEXT! Such a wonderful book. Also, I felt the same way about MYSTIC SUMMER. I love books set in my home state (especially somewhere as gorgeous as Mystic), but it just lacked some kind of spark for me. I still plan to read her others though, for sure!